1. Click on the button from your options toolbar on the left hand side of your screen. 4. In the text area, enter your question. 5. Click the and enter an Answer option. 6. 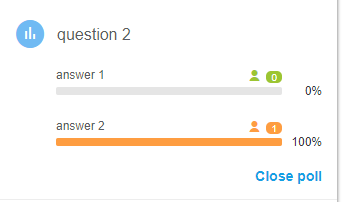 You can add more Answer options by again clicking that button. 7. If you want to allow multiple answers from your audience, check the checkbox. Once you have the poll question prepared – you can either then Save or Save and open the poll. Save : will save the poll to your content library, so that you can use it later – it can even be used across multiple sessions! Save and open: will also save the poll to your content library – but also open it for your audience to begin voting. Once the poll has been opened – the audience can begin interacting with the poll. 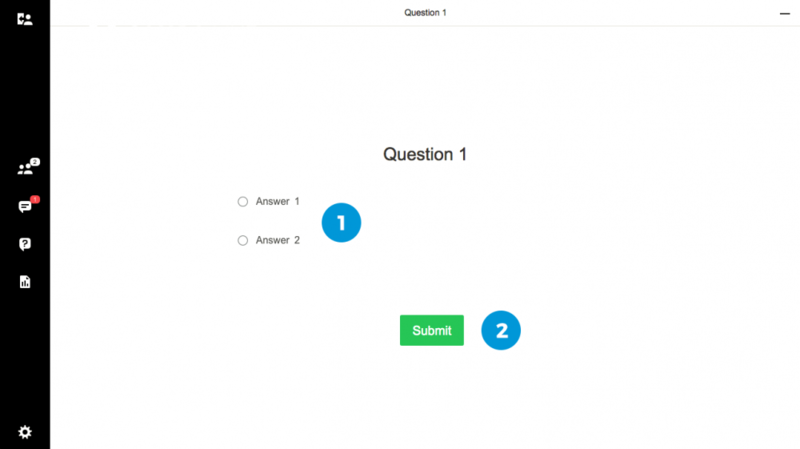 !Audience should be instructed to select their answer and press the Submit button. Speakers can keep updated on the progress of their votes in the Content Library. Speakers can stop the poll and prevent any more voting. Click the button. Share Results : This will share the results of the poll with all the people in your meeting. Add to group : This is where you can create folders, and organize your polls into groups. Edit : This will allow you to edit the poll. NOTE : You should Clear and Re-open the poll if new options have been added, so your audience can re-vote with the new options. Clear results : This will delete all previous votes in your poll. Export : This option allows you export poll results in .txt, .pdf or .csv format. Delete : This will delete the poll.